Coach Kriner is in his first year as head coach of the Hornets after spending 10 years as an assistant Varsity coach and head JV coach, and is in his 13th year coaching the boys basketball team. Coach Kriner is a 2004 graduate from Wellsboro High School, where he lettered in football, basketball, and track. Coach Kriner was also a senior captain in each of those sports. While in high school, Coach Kriner received the coaches award for basketball in 2001 and 2002, the Rev. Wade Stewart Memorial Award in 2003-2004, and the Larue Wilson Memorial Award and was a third team All-State tight end as a member of the Hornet Football team. Since taking over the helm at the JV level, Coach Kriner has won over 100 games, with his best seasons being 2008 and 2015 where he finished 21-1 both years. Coach Kriner also won the Wellsboro Booster Club Holiday Tournament that same year. After graduating from high school, Coach Kriner attended Mansfield University and graduated in December of 2008, earning a degree in Criminal Justice Administration. Coach Kriner currently lives in Wellsboro and works for the Tioga County Department of Human Services as a Child Care Worker. 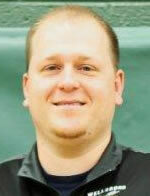 View Coach Kriner's alumni profile. JV basketball falls to Galeton.